Saturday, a day for Northstar Dodge Chrysler to host High Level and region’s local show and shine, a day overcast with rain drizzling over each car, beading upon protected finishes of silicon and carnauba. With such weather it fits that this Northstar Dodge Chrysler dealership is situated on Rainbow Boulevard. At 11:00 a.m., vintage car owners/collectors gather, cars being organized according to timeline – oldest to newest. These car buffs have had time to wake, wash and chamois their prized vehicles. The day becomes one of chatter, car-owner to car-owner, driver to driver, enthusiast to enthusiast. Within all the coffee, talk and bluster, an engine’s patter catches my ear, the sound sharp like a newly built V8, but the sound has a lighter, tubular aspect that is higher pitched – a 1928 Pontiac sedan arrives, its owner guiding it carefully into the spot allocated for the oldest vehicle at this show and shine. I’m impressed by its colour, shape and current integrity. The radiator cap is the head of an Indian (Pontiac) and the top curve of the radiator has something that looks like two pennies, something I’ll have to research. I walk over to listen and watch as the owner demonstrates what he refers to as the vehicle’s air conditioning – he moves a crank high above the steering wheel, to the driver’s right; the crank moves the windscreen up and down to let air rush into the car, a mechanical innovation that makes sense … something that begins this day’s education about cars. I get a kick out of what this car represents – this Pontiac sedan precedes my father’s birth by four years, it precedes the second world war by eleven. This 1928 Pontiac sedan is one of three Pontiacs at the show and shine – there’s a brown 1970 Firebird and an orange 1970 Lemans with decals (something that would have had a specialized appellation, ‘The Judge’). These latter vehicles are a year newer than the two door, green, Canadian-made, 1969 Pontiac Parisienne, the family car that my brothers and I grew up in and the car we shared in high school; the lines on each are recognizably Pontiac. That’s something to see a vehicle that’s twin to your hubby’s first car. 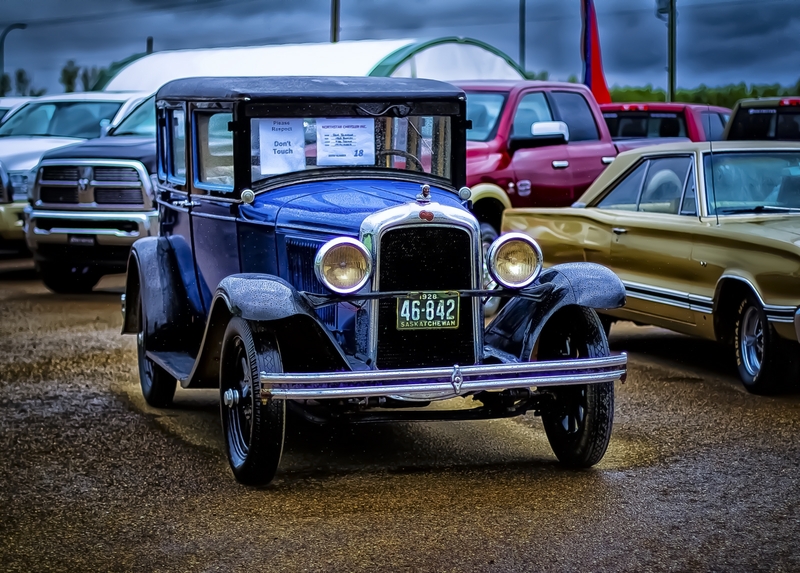 20 pounds … the sentiment of vehicle cost when each vehicle first made its way into use was a thing commented on by many at the show and shine, a curiosity when our economies are relative to the times … and relative to the age of the vehicle when it was purchased. No doubt, safety and braking were issues with the hill driving caution. We bought that Pontiac in 1960, and dad was right about the hills. It did start rolling backwards on a steep part! Gorgeous! What an impressive tribute to a 1920’s diamond. I especially like the colour on this one. You were right, the rain actually gave the show a different appeal. Perfect opportunity for pictures. I really enjoy your journalling as well as your photography. It is very poetic. Love, love, love the comparison of the weather with Rainbow Boulevard! Very impressive blog! Kind words, Allie … thank you.